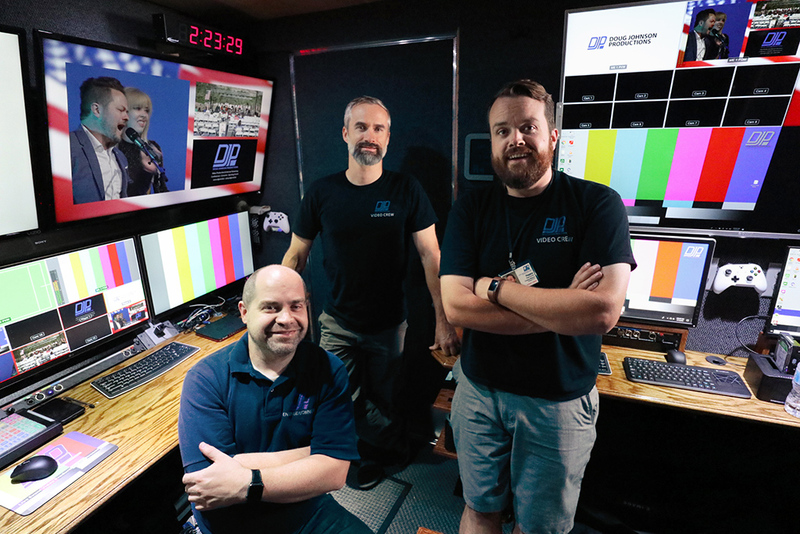 The core crew of DJP: Doug, Dave, and Paul, in the DJP MPU. We only get the level of equipment that is needed to do the job properly. For example, many video production businesses buy cameras that each can cost as much as a house! We don't do that. The only cameras we actually own cost a tiny fraction of that but are still able to produce an amazing picture. And in those cases where the big cameras are the right choice, we'll rent instead of buying. Not only does that save us (and you) money, it also means we can afford to keep the equipment up-to-date. Most companies doing professional video production are stuck with older, lower resolution 1080i or 720p cameras for many years, but we can cycle out equipment quickly, and as a result we have primary cameras which can shoot in Ultra HD 4K and we will be able to upgrade when something better comes along. We do have minimum standards for our gear, though. If a particular piece of gear isn't good enough for major players in the television broadcast or cable world, it isn't good enough for us either. You'll find the same gear we use at major facilities from the biggest names all over the world. In addition to keeping equipment costs low, we also keep our personnel costs low as well. DJP doesn't have employees in the traditional sense. We use vetted, trusted independent contractors. For you, that means you aren't paying for labor for days when we don't have any production going on; you only pay for the work you are getting and nothing more. On the flip side, it also means that when budgets allow, we've got access to the best of the best people for the crew. Companies that invest in a ton of equipment have to have a place to store it. By keeping our inventory relatively low, we don't have to invest in warehouse space. And you don't have to pay for equipment not being used or the storage space it takes up. We intentionally limit ourselves to the gear we can fit into production vehicles plus a small storage space to cover the rest. Anything that we don't need regularly is rented rather than purchased. Doug Johnson is both the owner and technical engineer for DJP. He has been a lover of technology since he was a kid, especially video and audio equipment. He has more than 25 years of experience with video, and nearly as many doing live video production. He is also an experienced software developer, and both created this web site and many of the software applications used in our productions. This allows us to do things like graphics, camera control, and slow motion replay in a customized way not available elsewhere. Why Choose DJP Over Someone Else? The other reason is the value we bring. We know that video production can be very expensive, and tends to be out of reach for many businesses. We are trying to change that. We are dedicated to bringing you the highest quality possible, while providing an affordable service accessible to nearly everyone.